Console messages are grouped now in case the messages appear multiple times consecutively. This feature can dramatically decrease number of logs and make the entire logging easier! The number on the right side tells how many logs is grouped in the log. Multiple selector trials are now shown as foldable groups of elements. These groups persist on page reloads and are dynamically updated when the page changes. 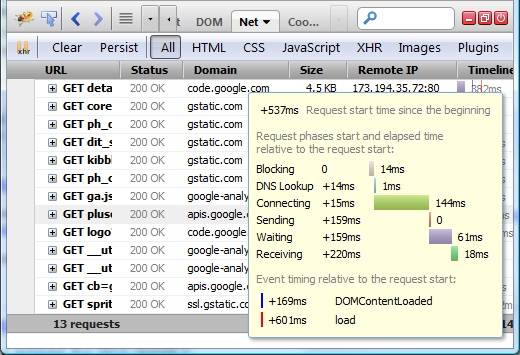 The tooltip for individual HTTP requests displayed in the Net panel has been improved. It displays all phases of the current request as a little waterfall graph. And so, it’s now a lot easier to understand the timing. This entry was posted on Friday, May 31st, 2013 at 8:23 am	and is filed under Firebug Releases, Firefox. You can follow any responses to this entry through the RSS 2.0 feed. Both comments and pings are currently closed.